First public announcement of new SCARA robots line. Flexible production to address current and future needs of consumers receives much attention from the manufacturing industry that has embraced Industrie 4.0. The days of rigid production environments are numbered and fast change-overs are a prerequisite to make sure customization does not affect OEE severely. OMRON has been a pioneer in successful solutions to realize flexible production in industries like automotive, pharma, and food & commodities. At Automatica 2018 OMRON will announce new hard- and software that will further optimize its industry leading portfolio for flexible manufacturing. To showcase OMRON’s advanced technologies relating to flexible production at Automatica 2018, OMRON features several DEMO's in which production environments are fully simulated. These interactively present the company’s core technologies for flexible production and enable visitors to experience today, the leading technology of tomorrow showcasing OMRON's Sensing & Control + Think technology. At Automatica 2018 OMRON will publicly announce its advanced New Line of SCARA Robots. The new robots boast more than the world-class sleek design. The compact controller (iCS) is fully integrated into a stylized base, minimizing footprint. The connectivity (EtherCAT & Ethernet) is available in the controller and arm. There is no flyover cable, which makes them simple to integrate. 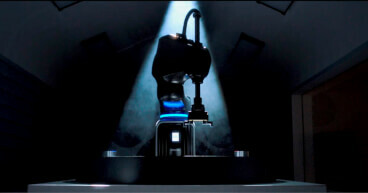 The new robots are fully aligned with Omron’s core innovative-Automation! solution, which aims to innovate the manufacturing environment with the three key ‘i’ factors – integrated, intelligent and interactive.